San Luis Obispo City Hall is located at 990 Palm Street, San Luis Obispo, CA 93401; phone: 805-781-7123. Photo: Robert Jack House, ca. 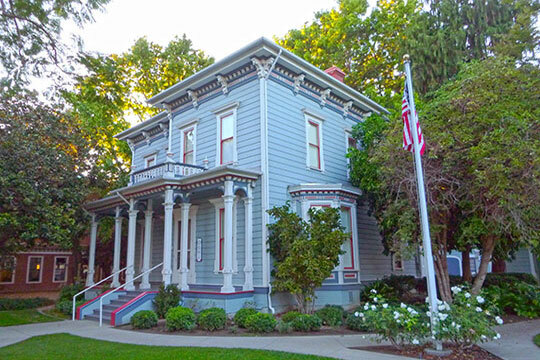 1882, 536 Marsh Street, San Luis Obispo, CA. Listed on the National Register of Historic Places in 1992. Photographed by User:Mountmonty (own work), 2012, [cc-by-3.0 (creativecommons.org/licenses/by/3.0)], via Wikimedia Commons, accessed August, 2015. San Luis Obispo is located in the Central Coast region of California, approximately 200 miles north of Los Angeles and 230 miles south of San Francisco. The area is naturally bounded by the Pacific Ocean to the west and the Santa Lucia mountain range to the north, east, and south. These mountains are also the source of the San Luis Obispo Creek, which runs through the city of San Luis Obispo and empties into the Pacific Ocean at Avila Beach. The creek flows along the Nine Sisters, a chain of volcanic peaks which originates in San Luis Obispo and extends west to the Pacific Ocean. The chain of hills forms the dominant scenic backdrop to nearly all parts of the city. The serpentine ridge that extends southeast from Cerro San Luis Mountain is flanked on the south side by the wetlands of Laguna Lake, much of which is preserved by the City today as a wildlife preserve. The topography of the surrounding mountain ranges forms a natural barrier that generally restricted the development of San Luis Obispo to the flatlands around San Luis Obispo Creek. The area was first settled by the native Chumash tribe, who established a network of villages along the creek. The region was not substantially explored by Europeans until the Spanish colonization of Alta California beginning in 1769. In 1772, Father Junipero Serra founded Mission San Luis Obispo de Tolosa on the banks of the nearby San Luis Obispo Creek. The establishment of the mission would ultimately have a devastating effect on local native cultures. The majority of the Chumash were conscripted into service for the mission, becoming church neophytes and effectively ending their traditional way of life. Diseases brought to the area from Europe, along with the significant changes to the culture resulted in a significant decrease in the Native American population during the mission era. The Mission, however, prospered and soon became self-sufficient, establishing vineyards and orchards and cultivating the surrounding land for agriculture. Due to its isolated location, the mission became a convenient stopover for those traveling between missions to the north and south, and the settlement soon established itself as a regional market center. From the late 1700s through the mid-eighteenth century, Spanish and Mexican ranchos had extended across the county. The California Land Act of 1851 prompted a dramatic shift in the residential development of San Luis Obispo during the mid-19th century. Surrounding ranchos were subdivided into smaller parcels of land, forcing many rural landowners to migrate into the city. In 1850, California was admitted to the Union, and in 1868 San Luis Obispo was officially designated as the county seat. From the early days of missionary settlement, the development of San Luis Obispo has been intimately connected with the surrounding landscape. The first settlements in the area were located near the San Luis Obispo Creek, whose tributaries provided a framework for the town's early housing and gardens. The surrounding landscape was largely dedicated to agricultural pursuits, including crops and vineyards cultivated by the mission and later by the adjacent ranchos. Construction materials for early mission buildings and residences, including thatch, wood, and adobe bricks, all originated from local sources. As the community surrounding the mission grew, the demand for construction materials increased and the variety of materials expanded in kind. While the development of San Luis Obispo's first commercial brickyard in the late 1800s replaced the earlier use of adobe bricks, quarries were developed in the surrounding areas to mine quartz, sandstone, and other rock for commercial construction. Agricultural activities in the surrounding landscape also evolved in the late 1800s. Vineyards, once abandoned following the secularization of the mission, were revived and a significant regional winemaking industry subsequently flourished. Following a major drought in 1862-1864, cultivation of the surrounding land shifted from cash crops to cattle, and a booming regional dairy industry was soon established. San Luis Obispo continued to grow throughout the second half of the 19th century as improvements in transportation increased access to the isolated area and created a direct connection to the coastal maritime industries. Stagecoach routes were first introduced in the 1860s and railroad lines were extended throughout the 1890s, allowing the area to serve as a regional hub for both trade and tourism. With the arrival of the Southern Pacific Railroad in the late 1890s the town and the local environs expanded into a burgeoning county. In the early 19th century San Luis Obispo served as a center of trade and travel in central California with the arrival of the railroad, the development of the Union Oil of California's (Unocal) oil fields, and the tremendous agricultural and dairy industries. In 1901, the California Polytechnic Institute was established in San Luis Obispo. The presence of Cal Poly, its focus on vocational and agricultural training, and its growing influence on the community significantly impacted the development of San Luis Obispo throughout the 20th century. Another significant influence on the central coast was William Randolph Hearst and his San Simeon Ranch, commonly referred to as Hearst Castle. The development of these two conspicuous landmarks, in addition to the historic Mission San Luis Obispo, served to stimulate the regional economy and influenced the growth in and around San Luis Obispo. In the 20th century, the advent of the automobile made it possible to expand development in San Luis Obispo beyond the central city. City services, utilities, and roads were also expanded and improved during this period to meet the needs of the growing city. Tourism, and in particular automobile tourism, continued to play a role in the area's development in the 20th century. While the economy slowed nationwide during the 1930s due to the Great Depression, the economic effects on San Luis Obispo were mitigated by the establishment of Camp San Luis Obispo, a military training camp. The creation of the camp caused a sudden and dramatic increase in population in the area, which influenced the development of San Luis Obispo throughout the mid-century. As training activity increased in preparation for World War II, more soldiers and their families moved to the area, and many returned after the war to settle permanently. San Luis Obispo evolved dramatically in response to the sudden and significant postwar demand for single-family housing in the 1950s and 1960s. Annexations expanded the city's boundaries and large residential subdivisions were constructed outside the city center. Historic Resources Group, Pasadena, prepared for the City of San Luis Obispo, San Luis Obispo Citywide Historic Context Statement, 2013, www.slocity.org, accessed August, 2015.